In just the past several weeks, two City for Champions projects have reached significant milestones: Officials and community stakeholders broke ground at the site of the planned U.S. Olympic Museum and Hall of Fame, and the University of Colorado Board of Regents awarded $61.4 million to go toward the William J. Hybl Sports Medicine and Performance Center at UCCS. Three of the four projects initially proposed (only a downtown stadium has lost traction, but is not yet dead) seem to be a sure thing. So where do these ambitious projects stand today? In December 2013, the city of Colorado Springs was awarded $120.5 million in state sales tax increment financing by the Colorado State Economic Development Commission. It was part of a larger amount made available through the state’s Regional Tourism Act. The four projects are: a 60,000-square-foot Olympic Museum complex, which received $68 million; the 340,000-square-foot Colorado Sports and Events Center, which was allotted $26 million; the 104,000-square-foot UCCS Sports Medicine and Performance Center, which received $14 million; and the 30,000-square-foot U.S. Air Force Academy Gateway Visitor Center, which received $13 million. Some of that funding is to be used for infrastructure improvements in downtown Colorado Springs. Each project has faced its own set of challenges, but the common obstacles involved financing shortfalls that threatened to shutter at least half of the proposed C4C projects. According to city officials, however, all four of the proposed projects still hold promise. “We’re feeling really good about [C4C],” said Bob Cope, economic development manager for the city of Colorado Springs. Of the four projects, the U.S. Olympic Museum and Hall of Fame — which has been called C4C’s anchor project — is the one that has seen the most action. On June 9, after four years of fundraising and logistics work, board members for the organization broke ground on a parcel of land donated to the project by prominent local developer David Jenkins. When complete, the museum campus is planned to include an Olympic Hall of Fame, theater, shops and dining options — and creates a new anchor for the city’s downtown core. Upon opening, organizers anticipate the facility will attract 350,000 tourists each year. The landmark structure is being made possible by state and local funding, bank financing and private donations. The Colorado Sport and Events Center is perhaps the most unlikely of the C4C projects to ever be built — for a variety of reasons. Since its inception as part of C4C, community stakeholders have disagreed about what and where the facility should be. Plans for the center have ranged from a downtown baseball or soccer stadium to a downtown expansion of the existing National Museum of World War II Aviation near the Colorado Springs Airport. And that unpredictability has made it a hard sell to potential financiers as well as the general public. In February, Colorado Springs Mayor John Suthers announced that organizers would have to make up for an almost $28 million funding gap in order to move the project forward. At the same time, Suthers said that he wouldn’t support using local public financing to cover for the shortfall — making it unlikely that the project would continue to play a part in the City for Champions plan. Subsequent plans to swap the sports and events Center with the 86,000-square-foot, $36 million National Museum of World War II Aviation were then shot down by the Colorado Senate in April. Despite difficulties thus far, Cope (in his city role of helping the C4C projects) said there is still a chance the facility will see the light of day. According to Cope, the city continues to work with potential financiers and community members to work out logistics before December 2018, which is when Colorado Springs is due to report to the Colorado Economic Development Commission on the project’s progress. “If we’re not able to make what’s called a ‘Commencement of Substantial Work’ by December of 2018, we lose the percentage of the award that was assigned to the sports and event center,” Cope said. A resolution in the Regional Tourism Act stipulates that each project must conform to the initial plan within 20 percent (which translates to minor changes to size, capacity, etc.) and another attempt to fund a different project with the same money would require another trip to the state Legislature. The next C4C project slated to break ground is the William J. Hybl Sports Medicine and Performance Center at UCCS, which recently received approval for $61.4 million in funding through the University of Colorado system. 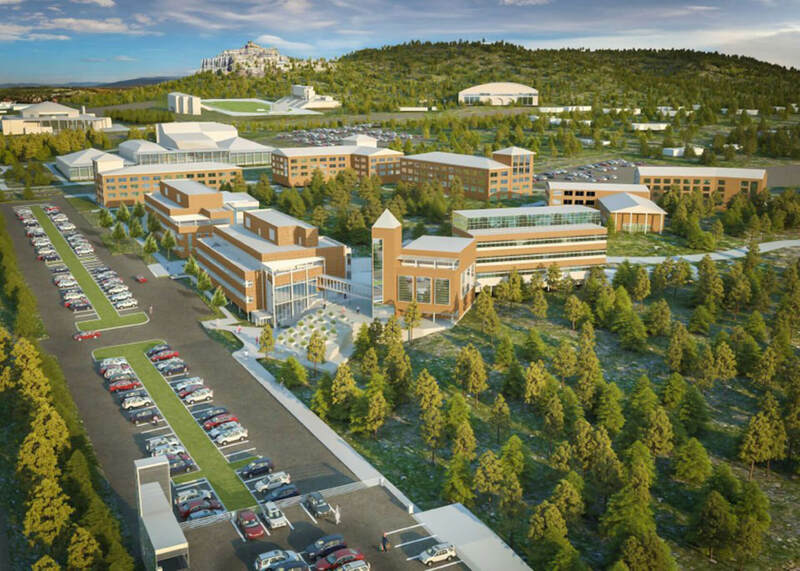 According to a university news release, UCCS will hire a design-build team for the project and begin construction in July 2018, pending approval from a legislative committee that is scheduled to come later this month. The center is expected to open in December 2019. “We’re confident that project will move forward and be successful,” Cope said. The facility will be located north of the UCCS Lane Center for Academic Health Sciences on the east side of North Nevada Avenue. Plans are for a 104,000-square-foot building costing $61.425 million and will also include a Center for Tactical and Occupational Performance, a Center for Athletes and Active Individuals with Physical Disabilities and an Environmental Health and Performance Center. The Hybl Center is expected to offer services in orthopedic sports medicine, primary care sports medicine, physical therapy and rehabilitation, occupational therapy, athletic training, pain management, imaging, body composition and bone health services, performance training, occupational and tactical scenario training and altitude training. The U.S. Air Force Academy has remained quiet about its progress on plans for a new Gateway Visitor Center, Directorate of Installations Carlos Cruz-Gonzalez says its still moving — albeit slowly — toward becoming a reality. Although optimistic USAFA officials and community stakeholders had hoped for a groundbreaking in 2017, Cruz-Gonzalez said construction will likely begin in 2018. Like the other projects, USAFA must report substantial work to the Colorado EDC by December 2018 to retain its RTA funding. “That’s our big deadline,” he said. Cruz-Gonzalez said the process has been delayed because of a fruitless first round of USAFA’s “Request for Qualifications” process that began last May. “We received three proposals in early September, but we decided to cancel that RFQ and make some adjustments to the process based on what we learned,” he said. Based on feedback and conversations with development experts, Cruz-Gonzalez said a new RFQ was drafted and will be issued by the end of June. The goal, he said, is to select a bid and begin working with a development team by the beginning of next year.